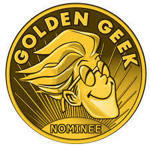 BGG has announced the finalists for the Golden Geek Awards, and there's some great stuff in the list! BattleLore is a personal favorite of mine, and I've also had a lot of fun with XCOM: Enemy Unknown, Torchlight II, and Shadowrun Returns. Another interesting thing to note is that the video game category has a few board games on it. In fact, all three of the mobile/handheld games mentioned are mobile adaptations of board games: Agricola, Lords of Waterdeep, and Ticket to Ride: Europe. More and more people are experiencing deep, strategic board games for the first time on their phones or tablets. It's a trend that we in the industry can't ignore, and one that ultimately helps us, I think. I'd also like to point you toward the RPG category for a moment. As you may or may not be aware, Marketing Director Lenny Balsera and I are both writers and game designers for Evil Hat Productions, and we both worked on the Fate Core line of games. In each of the three categories in which a Fate game could be nominated, it was nominated. Game of the Year? Fate Core. Best Artwork and Presentation? Fate Core again. Best supplement? Fate Accelerated and the Fate System Toolkit. To see these games standing toe-to-toe with the likes of Numenera and Star Wars: Edge of the Empire is a tremendous honor for everyone involved with Evil Hat.